It can take some time to get used to hearing aids. As well as your audiologist needing to fine-tune the settings to your individual needs, you also have to learn how to fit them into your daily routine. However, the improvement they can bring to your quality of life makes them more than worth the time it takes to adjust to them. Wearing hearing aids for the very first time will make some sounds seem louder, while the range of sounds that you will be able to hear will improve. You will be able to hear things you may not have heard for a while, such as birdsong or even the hum of the fridge. This can make the world seem a little overwhelming, so your brain (and ears) will just need a little time to adjust to your new way of hearing. To help this adjustment process, you could take short breaks from wearing your hearing aids, or turn down the volume slightly. You may also want to begin by wearing the aids in quieter environments, such as your home, and then gradually move on to social situations and crowded places. This will help your brain to learn how to process background noise without it becoming tiring or uncomfortable for you. As with anything else, practice makes perfect. Commit to wearing your hearing aids every day, even if it’s just for a few hours at a time. Slowly increase the amount of time you spend with them on, and soon you will be used to wearing hearing aids through the day. However, it is vital to remember that this adjustment process can take weeks rather than days. If you have any questions or concerns about your hearing aids, just ask us. Leightons’ experienced audiologists are always happy to help, even if your query only seems like something small. 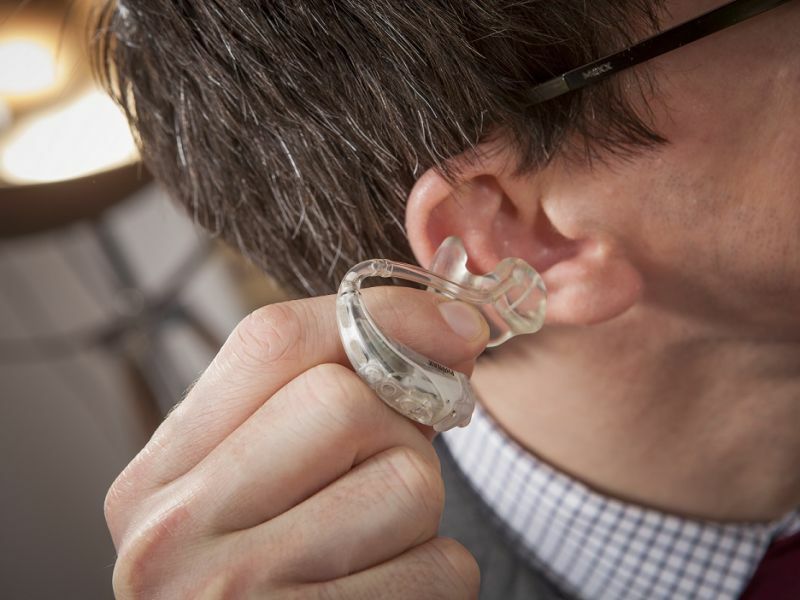 At Leightons, we offer a free hearing aid demonstration as part of your free hearing test, options for a free trial and free aftercare once you’ve found a hearing solution to suit you. The most important part of the whole process is making sure that you are happy and comfortable with your hearing aids, so your audiologist will take all the time you need to ensure they are perfectly tailored to your requirements. For more information on our hearing aid services, call us on 0800 40 20 20 or visit your nearest branch. You can also book a free hearing assessment online.